All of the speeches at the AIPAC Policy Conference during the past few days went according to script. Every U.S. politician who addressed the 13,000 in attendance weighed in on the threat of a nuclear Iran, enumerated their party's accomplishments in defending Israel, and reiterated their commitment to the U.S.-Israel relationship. But there was one surprise. On the final morning of the AIPAC conference, the U.S. Secretary of Defense Leon Panetta discussed his close personal friendship with former Israeli Prime Minister Ehud Barak and the family dinners they have shared ("We talk, we argue, we eat... we are family"). He also recalled accompanying President Bill Clinton to Israel for the funeral of Yitzhak Rabin in 1995. Panetta also disclosed that the first congratulations he received after the successful capture of Osama Bin Laden in Pakistan were from his buddies in the Israeli Mossad. And then Secretary Panetta mentioned the little known fact that he and Sen. Chuck Schumer of New York were once roommates when they both served in the House during the 1980's and early 1990's. That wasn't the surprise though since Schumer has, on several occasions, reminisced about rooming with Panetta and other congressmen in a shared house. 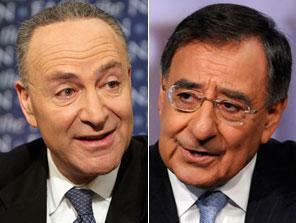 The surprising tidbit came when Panetta shared that he and Schumer bunked together in the living room of the house and before bed each night Schumer would get Panetta to say the Bedtime Shema. Panetta deadpanned toward the end of his speech, "Each night before we went to bed he made me say the Shema... but I probably just said a Hail Mary!" I was never aware that there is a custom of Jews getting non-Jews to say the Shema. I wrote about Justin Bieber's manager Scooter Braun getting him in the habit of reciting the Shema before each concert and now this. I'm curious to know which other non-Jews out there are saying the Shema. This might just become a trend. Hinei lo yanum velo yishan schumer Israel.